When your dog is left unattended, he or she may tend to get into a bit of mischief. While you’re away for the day, it might not be uncommon to come home to a chewed couch, slobbery shoes, or miscellaneous doggie accidents. What are you to do? The most common doggie disasters stem from boredom; if your dog is bored, he or she is more likely to chew, bark, dig, knock things over, and beg for attention. The following checklist offers valuable tips and tricks for reducing doggie boredom. Getting adequate exercise is considered the most effective way to reduce a dog’s boredom. While you may think that one walk a day is more than enough, your dog acting out is a reliable indicator that this isn’t the case. While the “right” amount of exercise varies greatly between breeds, sizes, energy levels, and age, your dog should get some sort of exercise several times a day. As an owner, the best way to tell if your dog is getting enough exercise is to pay attention to how they act in response to varying levels of activity. If your dog is rambunctious and frustrated after one hour of activity, you know that they likely require higher intensity or more time-consuming workouts. The right amount of vigorous activity acts as an energy outlet and reduces the likelihood that your dog will seek out negative activities to burn energy. Dog-to-dog socializing has tremendous benefits, including enhanced play time and higher cardiovascular activity. Additionally, evidence suggests that dog-to-dog contact helps pups learn how to respect boundaries and be polite. As an owner, you want your dog to respect you as their leader and protector — being around other dogs helps instill this instinct and can result in enhanced obedience. Dogs are incredibly intelligent animals who require mental workouts as much as physical ones. Playing is a great way to both mentally and physically stimulate your dog. Because negative behavior is tied to boredom, stimulating your pup’s brain through play reduces their desire to negatively act out. Playing is also a great way to spend quality time with your dog and can serve an important role in reducing your dog’s need to beg for attention. 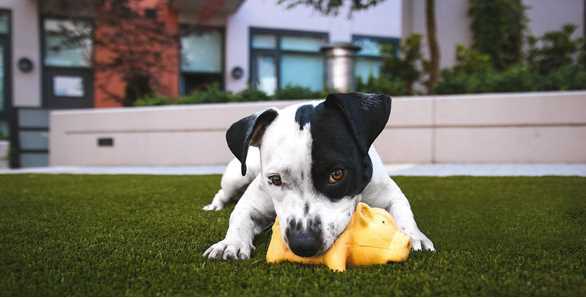 Consider investing in some puzzle toys, dog chews, balls, and frisbees if you want to stimulate your pup’s mind and body. If your pup is acting out while you’re at work, this is a good indicator that they need some love during the day. Having a dog-walker drop by once or twice a day can reduce stress while ensuring that your dog has a positive energy outlet during the day. Talk to a neighbor, post an ad, or seek out a professional dog walking service — your puppy will thank you. If you travel for work or have an incredibly busy schedule, consider investing in a pet-sitter. Pet-sitters are individuals who come to your home and stay with your dog more a few hours, days, or even weeks. Depending on where you live, doggie daycares are also a viable option for longer-term stays. If your pup needs a lot of company and activity, making use of a pet-sitter as needed will give you peace of mind and keep your dog active if and when your schedule makes it difficult to do so. If you want to say goodbye to the ripped carpet, spilled water, and relentless barking, start thinking about how boredom may be affecting your dog. Frequent physical activity, dog-to-dog socializing, and fun play sessions will reduce your dog’s drive to act out for attention. Whether these activities are instigated by you, a dog-walker, or a pet-sitter, you will be able to make frequent doggie disasters a thing of the past. Previous Previous post: Dog Fear of Loud Noises Thunderstorms and Fireworks- What you need to know!